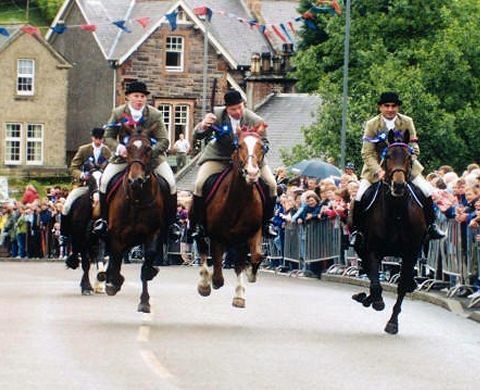 Border-Reiver-Country-Langholm-Common-Riding | A blog about the history of the Border Reivers from the 13th to the 17th centuries. In 2015 it will take place on Friday July 31st. 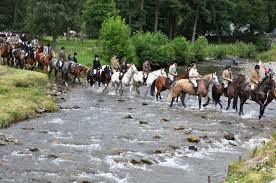 This entry was posted in British history, Great Britain, real life tales, Scotland and tagged Border Reiver, Common Riding, equestrians, Fair Crying, Kirk Wynd, Langholm, Scotland, traditions. Bookmark the permalink. The Croon o’ Roses through the lift is farin’. Thanks for adding the poem, Marie. I was unaware of it. A man standing on the back of a horse…. that is amazing. If I were standing on the back of a horse, you would hear me screaming as I fall off! Thank you for this very fascinating bit of history. No circus acts for you, June? Me neither. I so wish to take this in some day.